Scandinavian Travel Services offers a great adventure, which will give you an opportunity to discover one of the most breathtaking landscapes in the country. The trip will start in Árnes, the place that can be found near town of Selfoss. The famous Ring Road passes through the city, so this trip is very convenient if you are driving trough the Ring Road. The first destination of the tour is Hjálparfoss, this stunning two stepped waterfall is located near the confluence of two rivers Thjorsa and Fossa. Near the waterfall you will find many signs of Hekla's eruption: there are ashes everywhere. The next stop is Ljotipollur, that is translated "Ugly pool" although it is quite far from the reality! This fascinating crater was formed during an eruption back in the 15th century. The view from here is unique and there would be plenty of photo opportunities! 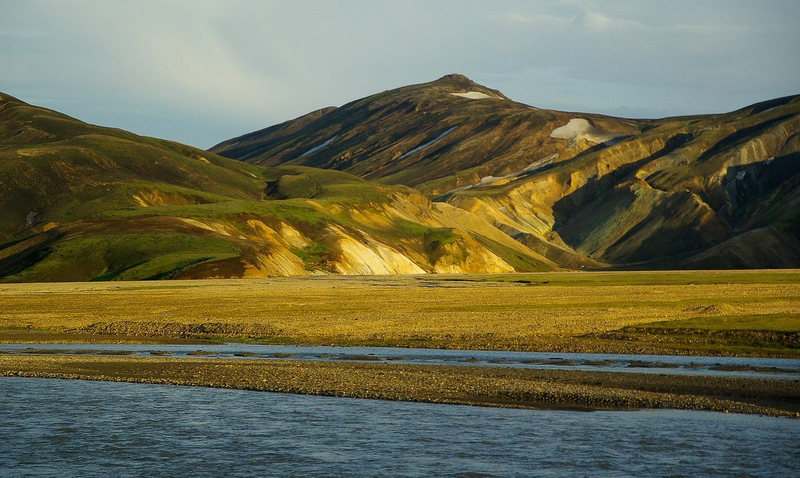 After that, the group will head towards Landmannalaugar, here you can either enjoy bathing in geothermal hot springs or follow one of the famous hiking trails. The duration of the trip is approximately 7-8 hours, the trip can be booked all year long and the number of participants vary from 2 to 20. The price for this tour is 32.900 ISK per person, children between 12-16 will have to pay 16.450 ISK and the trip is free for children under 12.